Counts and times switch closure inputs. Triple buffered time/count in 32-bit format. Supported By EDS HA5, and HA7. As many as 100 devices on the net. ESD protection on 1-Wire and count inputs. The CT1 Counter is designed to count and maintain switch closure pulses from dry contact devices such as relays and magnetic reed switches. A 32-bit time stamp is maintained with the last three transitions to the active (closed) state. The CT1 Counter provides the necessary switch excitation voltage, so no external power source is required. 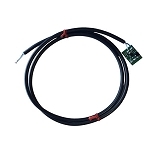 The cable provides electrical connection to the 1-Wire network. The output is digital, all data conversions are done internally. Therefore, distance to the sensor is unimportant for data integrity and it may be placed up to 1000 feet. In addition all I/O and data communications with the sensor are CRC16 error checked for accuracy. The data is stored in RAM memory as a TMEX data packed record. The most recent three counts and times are stored, most recent first, in memory. The user can determine rate, total time and total count at any time with a single read of the TMEX file format compatible RAM page 2. The CT1 Counter has a built-in multidrop controller (DS2423), which provides two unique 64 bit registration numbers (8-bit family code + 48 bit serial number + 8 bit CRC) assuring error-free selection and absolute identity; no two parts are alike. Unique addressing allows I/O function to be identified absolutely, no more dip switch address confusion. All unique counter identification and calibration data is stored in on-board ROM memory for easy installation and setup. The CT1 Counter is compatible with the EDS HA5, HA7E, HA7Net, HA7S and the Dallas Semiconductor DS9490R, DS9097U and Tini 1-Wire interface products. The data is stored as a 28 byte record packed in TMEX file record format. This record contains the most recent three sets of 32-bit times and 32-bit counts. The data record is CRC-16 error checked for accuracy. The CT1 Counter data record contains the three most recent time/count values. This consists of 3 8-byte fields starting with the most recent time/count value each in 32-bit format. The data is stored in the RAM memory of a DS2423 in page 2, memory location 0040 Hex. The record is organized as a TMEX file record with byte count, data, continuation pointer and CRC-16 for a total of 28 bytes.